So in Fort Worth, everyone knows that you can find great craft beer and lots of selections in downtown Fort Worth at The Flying Saucer. But now it looks like downtown Fort Worth will have some competition for Best Downtown Beer Pub. This pub doesn’t mess around. What do they do best? Serve craft beer. Do they do much else? No. They focus on what matters…the beer. There is no kitchen at this joint. You may order food to be delivered, but the only thing this pub delivers is beer. This bar was started by a duo who had a dream of being able to provide great beer to the great city of Fort Worth and have made it happen. When you go in you can almost always find one of them working the bar and making everyone feel at home. What you just read above is a true love of good beer. This helped win over the bar for me. But if that story alone doesn’t do it for you, allow me to provide more points for you. The weekly specials here are incredibly strong. Every day there is a happy hour from 3-7 that gives you 20% off, but on Wednesdays and Thursdays there are added specials. On Wednesdays, you can utilize the Brass Tap to expand your beer tastes. 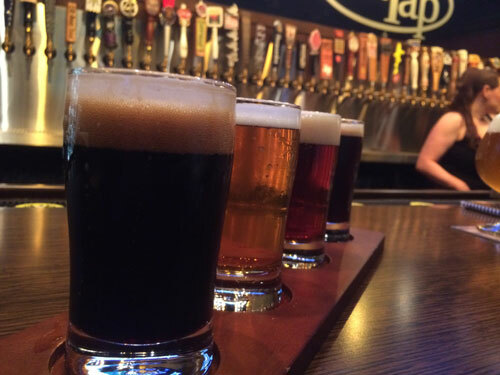 With over 60 beers on tap, there are surely some that you have not experienced before. On Wednesdays you have your chance to give them a try. You can buy a flight of four beers and choose which ones you would like from the wall. After you have tried all four, you can tell your bartender/server which one you liked the best and then get a free pint of your favorite beer from the flight. Fantastic deal for the beer connoisseurs like myself who pride themselves on trying so many different kinds of beers. The next special occurs on Thursdays and is a Blow the Keg special. Every Thursday a list is printed of the kegs that are almost empty. The game is to be the one to order the beer that blows the keg. Why do you want to be this person? Because then you get what’s left of the keg and get to choose another beer off the wall. If one and a half beers wasn’t enough, you also get to choose what gets tapped next in its place! This gamification to drinking helps to provide an interesting element to your beer selection. You find yourself antsy for the server to come back knowing that worst case scenario, they have a great beer for you. Best case scenario, you have won and hold the power over what will be served next. Ultimately this pub has become one of my favorites in Fort Worth. If you haven’t been already, please go. You will not regret it.